Ok, enough teasing. 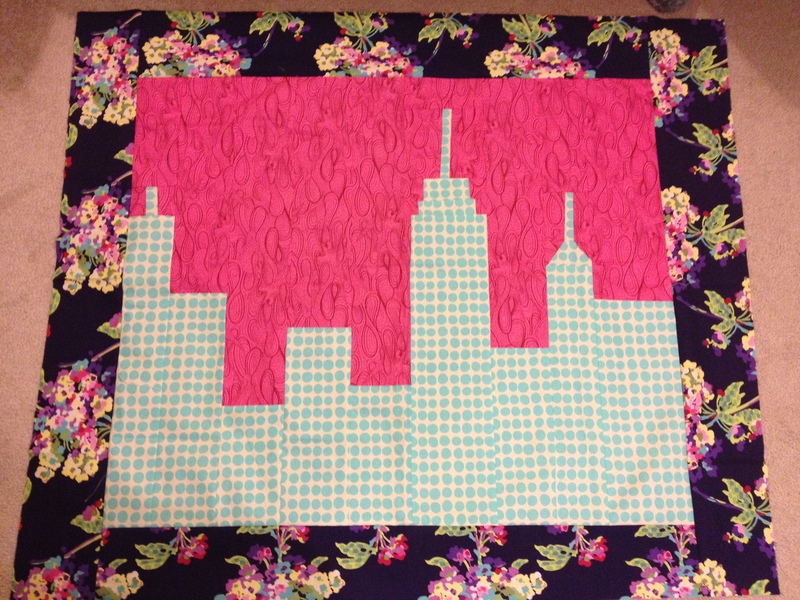 Here is the finished mystery quilt, made for my sister and her daughter, who is due to join us in just two weeks. I’m including some blurry camera phone pictures of work in progress to tell the full story of how it came together. 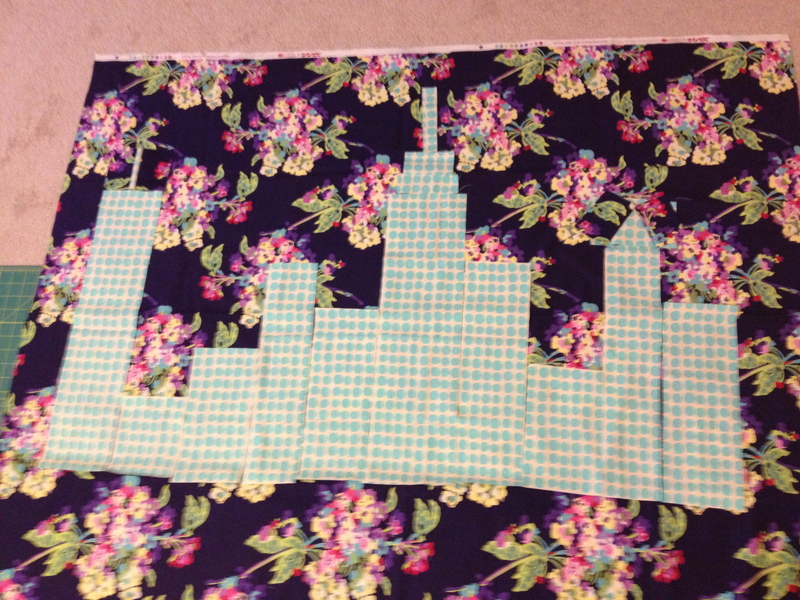 I had the idea to make a skyline after folding Hazel’s quilt in half. I noticed that the white edges looked like skyscrapers. 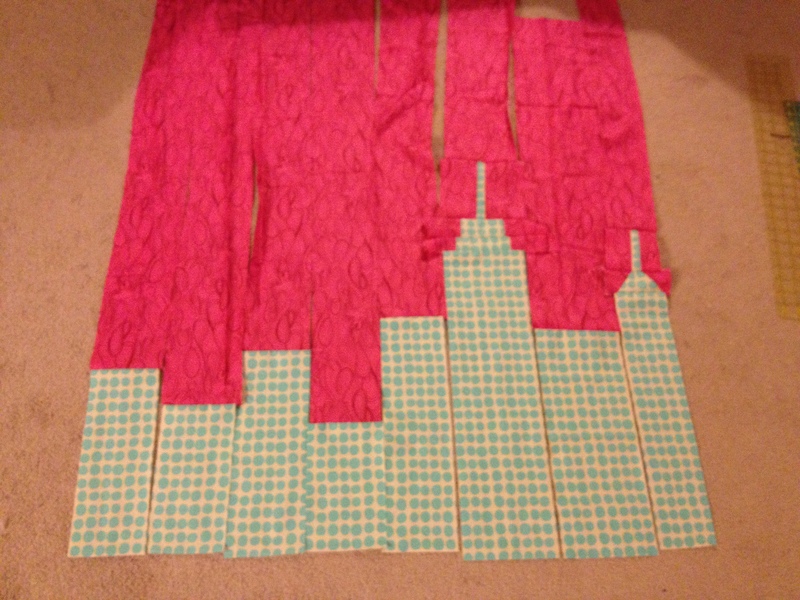 My sister lives in Brooklyn and her sister is a city planner, so the skyline made the idea personal. The deep purple floral fabric from Amy Butler was the first that drew my attention. I wanted to pair it with the blue dots from the same collection to make buildings and sky, but the large scale print of the flowers didn’t hold up to my piecing technique. 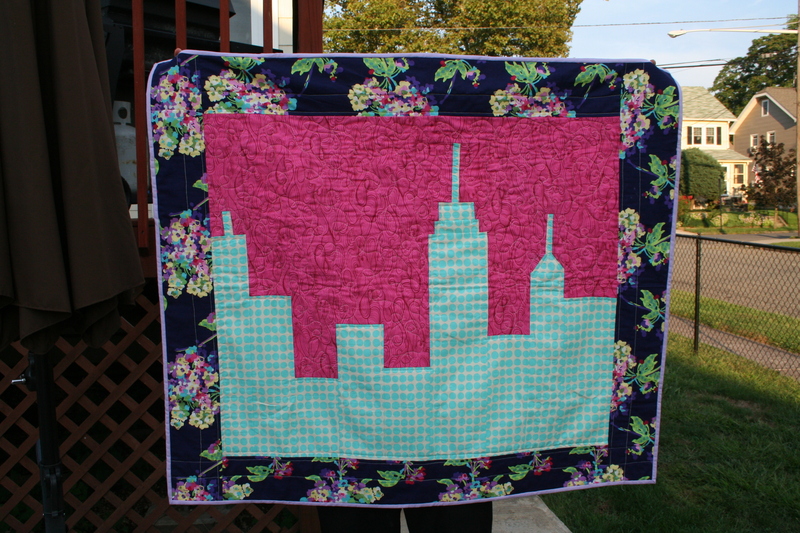 My sewing mentor (shhhh…I haven’t told Beth that I call her that yet) suggested that I use a print that would look more solid after piecing some of the smaller building elements. I found out that the baby’s room was purple with a pop of bright pink, so I picked a pink with birds in it. I love the cheeky way it emphasizes that it is sky. After that, it came together so easily and with a lot of joy. I hadn’t improvised so much before, and it was really quite scary not to know how things would work out. But in the end, what worked is what looked good. 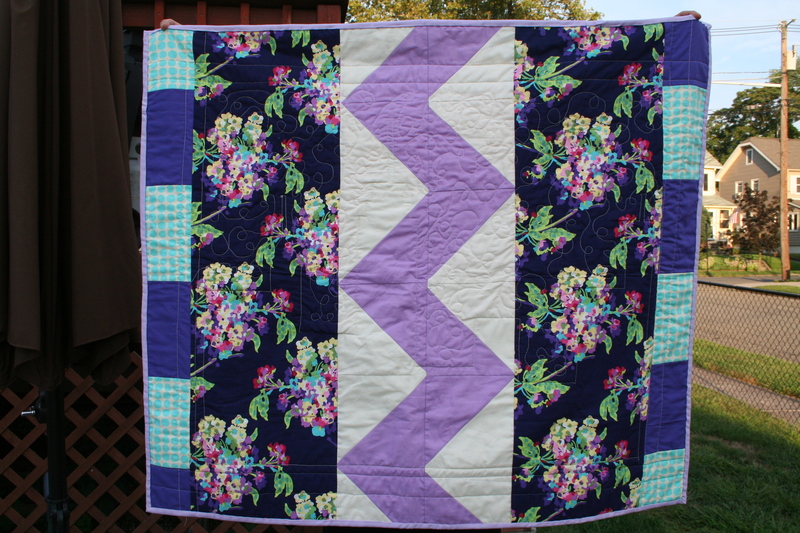 I used the purple floral as a border and in bigger panels on the back. 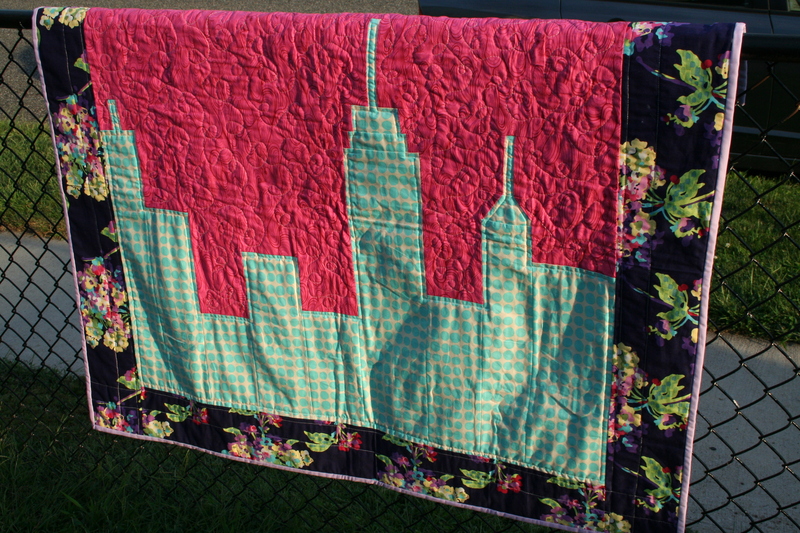 I quilted the border with straight lines and used straight lines to follow the seams on the skyline. The sky was quilted in my favorite loopy style. I was a little disappointed that I couldn’t make the quilting look more cohesive on the back, but I really wanted to make something fun and detailed, rather than just using a single fabric (though that is better design in a lot of cases). I’ve always wanted to try a chevron, and I think that the back could stand on its own. I’m so proud of this quilt. Thanks for reading.